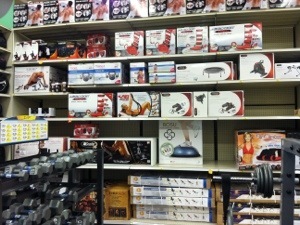 For a project at work I found myself at Academy Sports yesterday looking at free weights. Now, if you’ve seen me up close you are aware that I’ve never spent much time in the gym. But I exuded confidence as I waxed muscular with the frizzy haired attendant in the work-out department despite my underdeveloped biceps, triceps, pectorals, etc… (insert all muscle groups here except the jaw and lower back). All of these represent a different exercise promise made by an incredibly toned spokesmodel, both male and female, peddling the same thing: the most return with the least investment. Looking at the models on the boxes it was extremely obvious that they had not gone to the gym with that same philosophy. They were more interested growing their back accounts than the customer’s biceps. Aside from that, another thing occurred to me. Though all of the dozens of products on that wall were a bit different, they were unique in certain ways, targeting slightly different muscle groups, still they boasted similar results. And the thing that became apparent to me was that they all probably worked. If you put enough time and sweat in with any of them, you would likely see great results over time. There wasn’t one specific one that was tailor made for me or you, they were all made for whoever would work with them. My simple point is this: don’t let the myth that there is one devotional method, one worship style, or one cookie-cutter relationship with God for everyone. There are dozens of ways that have been proven throughout history to work for any and all different personality types. We find what “fits” us and then we work at it. If we put in the time, dedicate ourselves to knowing and fellowshipping with God, it will work. Waiting to find the “perfect” devotional system is an excuse, not a search. The only way we will find the growth and strength we want and need is to put in the time with whatever system we choose. Charles Finney said that revival was not hard to understand, it was as simple as farming. If we sow the seed, tend the soil, and wait patiently it will come every time.